Among the potential history Philadelphia’s rotation presents is the possibility of having four 20-game winners on one team. It’s happened only twice before with the 1920 Chicago White Sox and the 1971 Baltimore Orioles. Wins don’t mean what they used to for many baseball fans, but there’s no denying the significance of having four 20-game winners in the same rotation. So how do the top four pitchers in the Phillies’ 2011 rotation compare to the top four pitchers in the Orioles’ 1971 rotation? Can history repeat itself? The purpose of this exercise is not to determine which rotation is better, but rather to size up both rotations and offer an educated guess as to whether the Phillies can match the Orioles’ accomplishment. I believe it’s important to remember the past greats of the game and celebrate their achievements. This represents the perfect opportunity to do so. It’s entirely possible to celebrate modern greatness without overlooking or overshadowing prior triumphs. That’s the point here. 1. Starters today throw fewer innings and therefore have less opportunities to pick up wins. 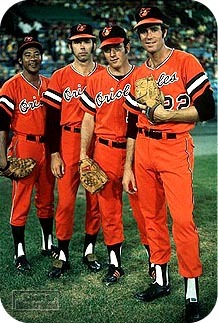 And the 1971 Orioles utilized a four-man rotation. Roy Halladay led all of baseball with 250.2 innings pitched in 2010. That total would be last among the Orioles’ top four starters in 1970 and is nearly 40 innings less than the combined average of Baltimore’s rotation. Consider the remarkable difference that exists in the approach to the game by era. The 1971 Orioles rotation averaged 287.3 IP in 1970 led by Jim Palmer’s 305 IP. By comparison, the 2011 Phillies top four picthers averaged 220.3 IP in 2010 led by Halladay’s 250.2 IP. 2. As Mike Mussina demonstrated for 17 of his 18 seasons in baseball, there’s a certain amount of luck involved in winning 20 games. Both the 1971 Orioles and the 2011 Phillies had/have remarkable pitchers in their starting rotation. Among each team’s starting four, only one pitcher entered/enters the season having never won 20 games. However, Baltimore’s 1971 rotation had three pitchers who won 20 games the previous season while Philadelphia’s 2011 rotation has just one pitcher who won 20 games in 2010. The likelihood of three pitchers holding form (Cuellar, McNally, Palmer) and one other catching enough breaks to win 20 (Dobson) is greater than the likelihood of one pitcher holding form (Halladay) and three other starters catching enough breaks to win 20 (Oswalt, Lee, and Hamels). Here’s a rundown of the numbers for the Orioles’ four-man rotation in 1971 (through the 1970 season) and the numbers for the top four members of the Phillies’ 2011 rotation (through the 2010 season). If you love great pitching, you’d have a hard time doing much better than this. Dobson – 0 and Hamels – 0. Image Source: Here (though the original appears to be from Sports Illustrated). This entry was posted in Orioles history and tagged 1971 Orioles, Dave McNally, Jim Palmer, Mike Cuellar, Orioles History, Pat Dobson. Bookmark the permalink. 3 Responses to Can the 2011 Phillies Match the 1971 Orioles with Four 20-Game Winners? I don't think we will see 4 20-game winners on the same staff ever again. The game is different. Pitchers lose wins with the bullpens and the days when the Birds went 9 innings for wins is over as well. Great stats. I can read that stuff all day. I don't believe the Phil staff will reach this achievement. Basically because of the structure of the game now. Not enough opportunities. But, I hope they approach it. That would give the O's 71 staff alot of national attention. Good for the organization and I love to hear it!!! That's a good point, Paul. The Phils could bring additional attention to the '71 staff. Anything that highlights O's history is good with me.